The Laddie Ten was one of the first truly exceptional single malts I ever tried, way back in Edinburgh in 2012. A whisky tasting was thrown in as a fun round-off to a technical conference and one of the Bruichladdich reps talked us through three expressions from the pre-Remy core lineup. With the 10-year-old being pulled back to a distillery-only release recently it’s great to see another Laddie making its way onto the core lineup. With global demand still incredibly high for Scotch, an eight-year-old malt is a more sustainable age to meet the demand without resorting to multi-vintage bottlings. Bruichladdich’s attitude to NAS bottlings is exemplary, though. They’ve always been open about the age of the whisky in the bottle (even if it’s not on the bottle, they make it known in the online literature) and their solidarity with Compass Box regarding the SWA ruling on showing “too much information” is heartwarming to see. Nose: Fresh barley grass! Very sweet and lively. Delicate straw, candy-floss, lemon drizzle cake, and butterscotch. A whiff of eucalyptus, pear skin and granny smith, then faint salty shells and sand. Finish: Warming and spicy with buttery oak and a salty, foamy edge. Ahhh – fruity, malty, salty and so buttery on the tongue. Good stuff, Mr Hannett. I shall be keeping an eye out for this next time I’m at the airport! 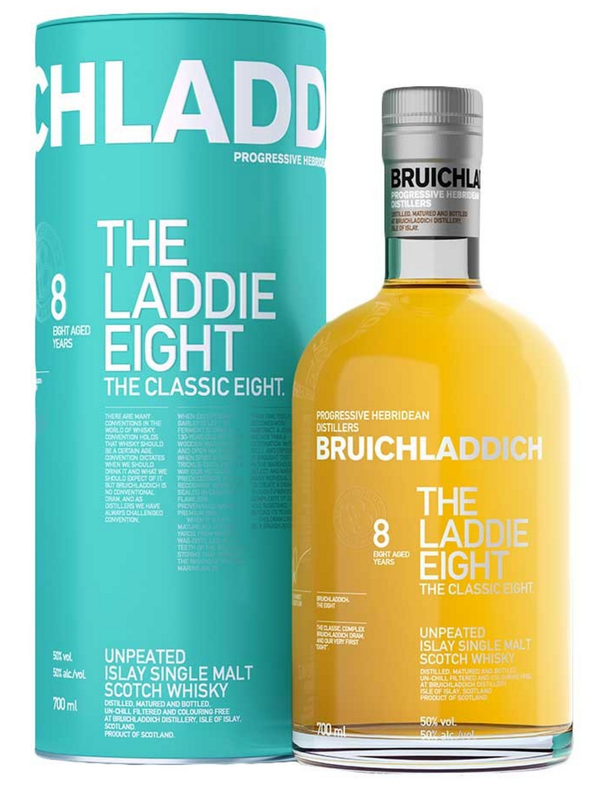 The Bruichladdich Eight is available now from World Duty Free for £44.99.